Barbara Faulkner of Palm Desert, California, quietly passed away on May 17, 2013 while surrounded by her loving family. Born in Cadiz, Kentucky August 29, 1932, she was the daughter of the late Dan and Freda Baldwin. In addition to her husband of 59 years, Edward Faulkner, she is survived by her daughters, Jan, Mrs. Tom Davidson of Santa Rosa Hills, California, Barbara, Dr. Barbara Morrow of Santa Fe, New Mexico, Leslie, Mrs. Jack Wadsworth of Fallbrook, California, son, Edward Faulkner III of Alta Loma, California, her sister Rose Baldwin of Carlsbad, California, three grandsons, Tyler Davidson, Wyatt Davidson, Steven Wadsworth and two granddaughters, Olivia Wadsworth and Brooke Morrow. A private memorial service was held May 22, 2013 at Grand Tradition Estates & Gardens, Fallbrook, California. Her family moved from Madisonville, Kentucky to Lexington, Kentucky in the summer of 1949 and Barbara enrolled as a senior at the high school where Ed was beginning his senior year. They met when they both joined the Student Council and had several classes together. As fate would have it, they were cast in their senior class play as the young lovers, 'Emily Webb' and 'George Gibbs' in Thornton Wilder's classic "Our Town." When they were later crowned King & Queen at their senior prom, it pretty well sealed and their life together. In the autumn of 1950, Barbara enrolled at the University of Kentucky in Lexington. Ed endured a year-and-a-half at the University of Virginia in Charlottesville before transferring to UK in 1952 to be closer to the lady he loved. She became the Band Sponsor of the University of Kentucky Marching Band and was crowned Queen of nearly every beauty pageant for which she was nominated during her four years at UK and was that university's selection for Queen of the prestigious 1954 Kentucky Mountain Lauel Festival in Pineville, Kentucky. With her blue-green eyes, flawless complection (no makeup!) and dazzling smile (you never ever saw a bad picture of her!) She was 80 years young at the time of her death and still a truly remarkable woman. She was a loving and devoted mother, appreciated for her skills playing the piano and being an accomplished flautist, an avid and incessant reader of biographies and...cook books!...and what a cook she was! Barbara was also extremely bright! 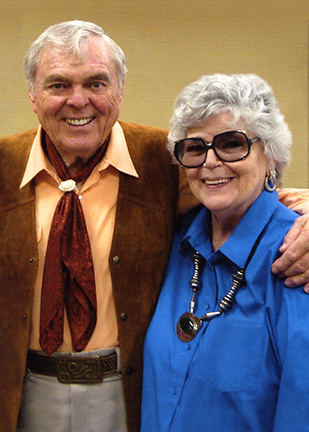 With her vast knowledge and experience in the 'film world' and her natural skills in communicating with the public, she was Ed's finest asset while they toured the country at numerous western film festivals over the past seven odd years. Someone at one of these festival reportedly said, "If you wake up in a bad mood and nothing seems to go right and if you have the opportunity to meet and talk with Barbara Faulkner....do so, because you'll leave her with a big smile on your face and comfort in your heart!!" We have the same reaction when we even think of her.